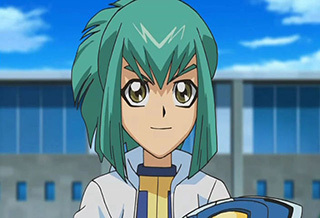 Luna (Ruka) – Along with her twin brother Leo, she aids Yusei Fudo, the main protagonist. Luna tends to get tired right after a duel. She has the ability to communicate with duel monsters after having spent ample time with Duel Spirits in a different dimension while in a coma. Much to Luna’s brother’s irritation, she tends to candidly point out the various flaws in his plans and flatly insult him. Despite constantly insulting Leo, she does in fact care deeply for her brother. When Luna first met Yusei, she was cautious about him, but later develops a hint of sisterly affection for him. Luna lives together with her twin brother Leo in the Tops resident area, spending most of their time alone together as their parents are usually at work and are educated via the Internet. Between her and her brother, she is the younger twin. A child prodigy, Luna has been dueling since she was three years old. Once, she Collapsed into a coma right after a duel, and did not awaken for a month. Upon waking up, Luna claimed she had been to the Duel Monsters Spirit World. This claim would prove to be true; for that month Luna’s mind lived among the Duel Spirits, under the protection of Ancient Fairy Dragon, and one of the Five Dragons. Before waking up, Luna and promised they would always be there to defend the Duel Spirits from evil. However, the pressure from undertaking such a task alone was too much and Luna had to forsake her promise, allowing the Duel Monsters Spirit World to fall to an unknown force. By present time, she and Leo rescued Yusei from Trudge after Luna sensed him being electrocuted by Security Officers, taking him to their home. Yusei attempts to leave so as not to get them involved, but the twins manage to get him to stay for the night. They awake the next morning to find that Yusei had left after modifying their Duel Disks to fit their arms. Although she knows what Yusei’s reasons are for leaving them, Luna starts developing an interest in him and comments that she would like to talk to him more. Luna was selected as someone to participate in the Fortune Cup. However, not feeling like participating, Leo attempts to duel in her place. The next day, he entered the Fortune Cup disguised as Luna, but using Zigzix’s Signer-detecting technology, Lazar was not only able to determine that Greiger dueled Leo instead of Luna, but also that his sister is a Signer. Luna faced off against the Professor due to Rex Goodwin’s consolation game but in the middle of the duel, both her and Leo are hypnotized. Luna’s conscious self awakens in the World of Duel Monster Spirits, where they sees the degradation of the Spirit World and decides to uphold their promise from then on. When the Crimson Dragon appeared in the middle of Yusei’s match against Jack, the five Signers were shown a vision of Satellite being destroyed by a mysterious spider drawing. After Yusei’s victory, Luna feels somewhat disturbed about the vision the Crimson Dragon showed them and talks to Yusei about it. They are also having nightmares involving the dragons facing against a dark enemy, and the Ancient Fairy Dragon falling victim to its attacks. She goes with Leo, Bolt Tanner and Yanagi to the Arcadia Movement to ask Sayer for Akiza’s help, but Leo is saved by Tanner and Yanagi and Sayer gasses everyone, imprisons Tanner and Yanagi, forces Leo into a duel and holds Luna captive under the care of Akiza. She is told by Akiza that she should stay with the Arcadia Movement, as she would be doomed to be rejected by her family and friends for her powers. Luna contacts Ancient Fairy Dragon for help and is told her servant, Regulus, will come to aid her. She escapes the movement as it is being torn apart by the Dark Signers. On the way out, they spot Akiza’s duel with Misty, and a barrier comes out of her birthmark, protecting her friends’ souls from being sacrificed when Misty summons her Earthbound Immortal. She and the other Signers go to Goodwin to learn more about the situation, and decide to venture to the Satellite to fight the Dark Signers. Following a tragic duel between Yusei and Roman, the leader of the Dark Signers, another Dark Signer, Devack, shows he is in possession of the Ancient Fairy Dragon’s card. Due to this knowledge, Luna, Leo and Trudge go towards where to find him. On they way, she is contacted by Kuribon, who requests her help, and is transported to the realm of Duel Monster Spirits. Whilst there, she discovers that time is distorted, and spirits are being turned into Minus creatures by minions of Zeman the Ape King. Luna teams up with a Spellcaster named Torunka in order to find Ancient Fairy Dragon’s servant, Regulus. After finding him, they go over to Zeman’s lair in order to free Ancient Fairy Dragon, and manage to defeat him. Luna is then transported back to the real world in order to help Leo defeat Devack and retrieve Ancient Fairy Dragon. With Devack defeated, Luna places Ancient Fairy Dragon in one of the control units powering the Original Enerdy Reactor to shut it down. Following the Dark Signers defeat, peace returns to the city and Luna attends Duel Academy with Leo and her friends. 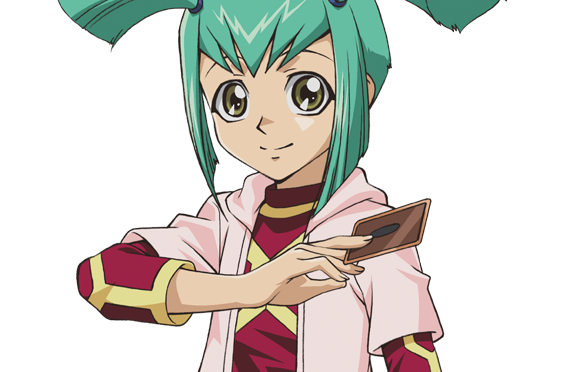 A transfer student named Lucciano enrolls in school, and gives her a Duel Board, a skateboard that can be used for Turbo Duels. However, when she practices with Leo, Lucciano, actually a member of Ylliaster, forces her into a Turbo Duel, along with Leo, and they both find themselves against Machine Emperor Sukiel. Despite her best efforts, Leo is knocked off the course, though he is saved by the Crimson Dragon. During this, Luna notices a strange pulse in her heart. Luna’s counterattack fails, but she is protected from harm by Regulus and her Duel Monster spirits. After the duel, they find Lucciano had disappeared and wiped the memory of the Duel Academy students. Luna plays a Spirit/Fairy Deck, consisting of folkloric creatures and enchantments, such as unicorns and fairies, with cards that focus on gaining lifepoints, protecting her weaker monsters and punishing aggressive strategies. Her dragon is Ancient Fairy Dragon, although the dragon’s card was in the possession of Devack. She goes to the Spirit World to free Ancient Fairy Dragon. After finding out what happened to Ancient Fairy Dragon, she returns to the real world and takes over for Leo, who was dueling Devack. Both work together and save Ancient Fairy Dragon, and Luna reclaims the card. In battle, Ancient Fairy Dragon can destroy a field magic spell and recover 1000 life points. This is a particularly useful ability since an Earthbound Immortal’s abilities are dependant on field spells. Her other key cards are Kuribon, a variation on Kuriboh, and Regulus, the servant of Ancient Fairy Dragon. In the third season, she is given a Duel Board, a motorized skateboard, by Luciano, allowing her to participate in Turbo Duels. However, it appears to be rigged to trap her in place when Luciano forces her to duel.